My wordcounts were in the toilet for much of this year. I’m shocked I got just under 81K for NaNo, even as a rebel working on several different things. 47K of that came from my WIP about my long-shelved character Anne Terrick. After about 25 years, it’s very surreal to write an entire book in first-person again, but diary form just feels right for this story. I managed to get some decent work done on Part II of The Strongest Branches of Uprooted Trees, even if I lost the roughly 2,000–5,000 words closing the penultimate chapter and in the rewrite of the final chapter. Baruch Hashem, I didn’t lost as much as I’d feared, and a number of things came back to me in the ensuing days. I also have excerpts from those lost words in my Twitter feed, from all the themed weekly writing hops I do. It won’t be the first time I’ve had no choice but to go back from scratch and memory to rewrite and reconstruct something. Though I waited till four days before the deadline, and almost gave up on the second day, I’m glad I went for it and wrote a story for this year’s IWSG anthology contest. Sci-fi is my next-fave genre, though I don’t give it nearly as much attention as I give historical. It ended up a bit over 5K. I also got some good work done on my fourth Russian historical, A Dream Deferred: Lyuba and Ivan at University. A lot of great secondary characters and subplots introduced themselves this year. I’ve just had to accept that this volume isn’t one of the ones which has been writing me more than I’ve been writing it, and that it won’t be finished as quickly as normal. I’m surprised to see I wrote a bit over 90K on Dream Deferred this year. It felt like much less, giving my depression and lagging wordcounts. I’m now back to working on the book formerly known as The Very First, which I’ll write more about in my January IWSG post. I’d thought I only had to finish up the chapter I’d belatedly added about the 1938 War of the Worlds radio broadcast, but I saw a great opening to add two new chapters concluding the year, and an Epilogue in January 1939, at Barry’s bar mitzvah. I’ve lost about 30 pounds since June. The weight I’d ballooned up to made my UMass weight look healthy. I still can’t believe I was that heavy and lived, even with my bone structure! I’m not happy at how I was shanghaied and blocked from moving home to Pittsburgh like I’d been excitedly planning to, but I remain hopeful I’ll be there by the end of 2018 and resuming my master’s program. I know I’ve been out of school for a few years, but I was far from the only student who was very unhappy with UAlbany’s library science program. My 17-year-old leafy baby, Kalanit, started the year just as depressed as I was. Her leaves were dull and drooping over the sides of her pot, and she hadn’t had any new growths for a few years. After she survived her longest car ride ever, 900 miles, and was put into a new pot for the first time ever, she came back with a vengeance. Kalanit’s roots had started to become impacted, but a larger pot and fresh soil worked miracles. She grew and grew like crazy, with a new baby almost every time I turned around. I’ll have to have a future post with pictures of Kalanit to show just how amazing her recovery has been. A lot of people have expressed astonishment when they find out I’ve kept a spider plant alive for 17 years. She’s been on a number of car rides and in a number of residences, including the four different rooms I lived in during my two years at UMass. Kalanit may soon need a larger pot, and possibly to be split up for the first time in years! I can’t change the fact that my depression and other mental health issues created much lower than usual wordcounts for much of the year. I do wish I’d backed up the most current version of The Strongest Branches of Uprooted Trees before the shocking disaster of August. At least I “only” lost maybe 2,000–5,000 words and a week or so of research, not the entire document. I didn’t think I’d get anywhere close to 50K this NaNo, given how dismal my wordcounts have been for much of the past year. I felt the only way I might get there was by being a rebel working on several different projects. This represents blog posts, my last day of work on my IWSG anthology story, my 29 November journal entry on George Harrison’s 16th Jahrzeit (death anniversary), the list of 2018 blog post topics I put together, and a WIP. Because I gave myself permission to fail, and decided to have fun doing whatever I wanted, I won with my quickest speed ever. My final wordcount of just under 81K still isn’t the best I know I’m capable of, but given my wordcounts during most of the past year, I’ll happily take it. Writing and researching my blog series on The Jazz Singer at 90 gave me back my writing mojo. The infectious charisma and personality of Al Jolson, which was responsible for making the film such a wild success, worked that same magic on me. So thank you, Jolie! I only started my IWSG anthology story on 29 October, and almost gave up on the second day. I’m glad I found the willpower to push through, even if I don’t win. I really enjoyed researching projected far-future developments, and finding sci-fi-sounding names. I titled it “Birkat HaChamah,” after the Jewish blessing of the Sun which takes place every 28 years. It’s happened twice in my lifetime so far, 1981 and 2009. I’ll have a future post re: how to write about this rare ritual. 47K came from Anne Terrick: A Bildungsroman, which starts in September 1840 and is told in diary format. I thought I’d shelved Anne forever in 1992, but she was meant to be if I never forgot her all these years. She was created (as Ann-Ann) when I was all of 5-6 years old. Going back to the 19th century after so many years is like learning how to write historical all over again. It’s also strange to write in first-person again, but the diary format of yore just seemed right. This story wouldn’t work in third-person. I came up with so many great ideas for characters and storylines from the previous final form of Anne’s story (which is in storage 900 miles away). I also moved her from Plymouth to Boston. Now, only her double-cousins and grandparents live in Plymouth. I’m delighted with unplanned secondary character Pastor Winterbottom, her minister and catechism teacher at her hated boarding school. He’s not a sympathetic character, but he’s such great dark comedy, and keeps getting better. The local writing group was neither as active nor interactive as my writing group back home (which I’m still officially registered with). I’m used to much more chatter at write-ins, several write-ins a week at fixed locations, and weekly write-ins the entire year, not just in November. For my 29 November journal entry, I counted my handwritten words (499) and entered them into a lorum ipsem generator. Also in honor of George’s Jahrzeit, I made a desktop picture with his last words (right) and one of my favorite lyrics (left). In memory of my old friend Fiona, who would’ve turned 37 today. In her memory, I gave the name Fiona to my character Baby Ryan when she and her siblings take legal names, and also used her surname for another family in my contemporary historical family saga about the Troys and Ryans. 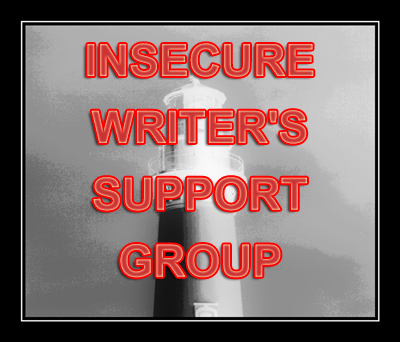 The Insecure Writer’s Support Group convenes the first Wednesday of every month, and lets participants share their worries, insecurities, triumphs, hopes, and fears. This month, I finally remembered to include the monthly question! My July wordcount was embarrassingly low by my standards yet again. Due to all the extenuating circumstances I’ve discussed, I had to set my July Camp NaNo goal at only 10K. It took almost the entire month to finally break even. I’m not proud of how low my final total was, but I did have a very strong finish. Unlike JuNoWriMo, this only counted words from my WIP, not together with blog posts. I also included words from my glossary (mostly various types of foreign cuisine), table of contents, and cast of characters. That, my final wordcount for the last day, is what I’m typically capable of. I normally write several thousand words a day, sometimes 5,000 or more. While I respect that some writers have a slower pace, or might only want to work on a paragraph a day, that’s not my style at all. I naturally write very prolifically, and when my wordcounts are only a few hundred words a day (if that), it’s a sign something’s very, very wrong. I came up with some great ideas for more subplots, chapter sections, and secondary characters for this book. These subplots include Sonyechka’s experience in fifth grade, and Tamara’s in second, based on my own. I’m planning a future blog post on how closely you should base characters and storylines on real life. I’m really excited about the final quarter (or so) of Part I. Since I write so long, I like to let things build for a really long time before things start coming to a dramatic head. I’m also really pleased with all the unplanned secondary characters and subplots I came up with, though I’m still dissatisfied with how I’ve been executing one of those subplots. Have you ever worked on a book where you weren’t consistently strong with motivation, creativity, and/or wordcount? Does it sometimes take until a certain amount of time into a period of working on a book (if you’re doing it in separated stages) for the writing to take off? P.S. : To mark next week’s special holiday, I’ll be fêting Rio on its 35th anniversary. I’ve really been looking forward to writing those posts, and hope my readers enjoy them just as much! I decided to take part in JuNoWriMo again after all, knowing I’d mostly be doing creative non-fiction in the form of blog posts. For most of the month, I doubted I’d crack 10K, and then I decided I’d consider it a win if I got 15K. My total was embarrassingly low by my standards, though I didn’t have a desk for almost the entire month, coupled with stress, moving (NOT to my desired location! ), and having very little privacy. This jerk zoomed right into my lane and tore the entire front bumper clear off. It’s a miracle no one ran into it after it flew into the road. He claimed he thought there was plenty of space to get in front of me, though he was right next to my car and squeezing me out of my lane! I can’t believe my ten-and-a-half-year-old car survived a journey of over 900 miles from NY to SC, only for some negligent driver to get me into an accident a month later. I went to a used bookstore recently, and finally found a much more updated translation of The Divine Comedy and La Vita Nuova. The hardcover in the back (which was cheaper) is an older version, but I loved that it has the classic Gustave Doré woodcuts. I’m trying to work on my fourth Russian historical, A Dream Deferred: Lyuba and Ivan at University, for my July Camp project. I wish I’d begun it right when the passion struck and I wrote out my rough draft of chapter-by-chapter notes in the summer of 2015, instead of saving it for that year’s NaNo, but it is what it is. Hopefully, the first draft will finally be finished within two more years. I did spend eight and a half years on my first Russian historical, over three major working periods, and then took about three and a half more editing, revising, and polishing it a decade later. I’ll be doing some more light revisions on it in the near future, to go along with an updated cover. How has your summer been treating you in regards to writing or life?